This week’s BEACON Researchers at Work post is by University of Idaho graduate student Travis Hagey. While doing fieldwork in the Dominican Republic helping collaborators look at habitat use of rare and unique anole lizards, I found a very rare species of anole (Anolis fowleri). I am a fourth year grad student in Dr. Luke Harmon’s lab at the University of Idaho. My thesis looks at how geckos (and some other lizards) use their sticky toes to adhere to surfaces. 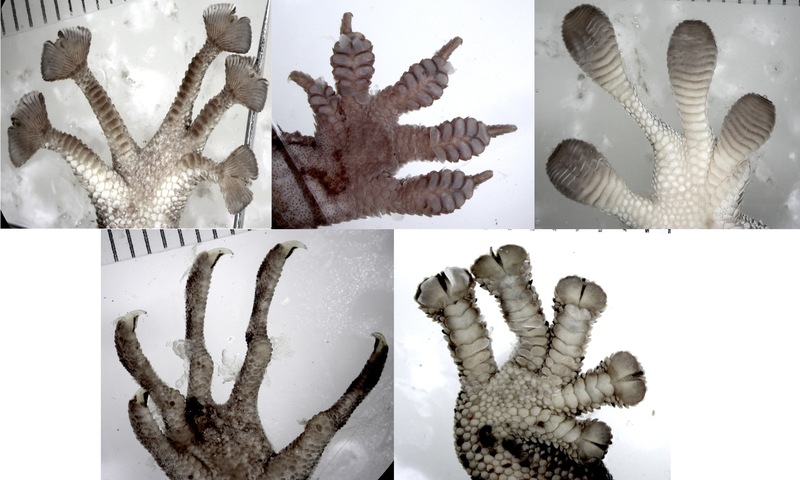 I also study the patterns of ecological and evolutionary diversification of gecko toes. By studying the details of geckos’ adhesive pads, we can understand the physics and mechanics of how toes stick (biomechanics). 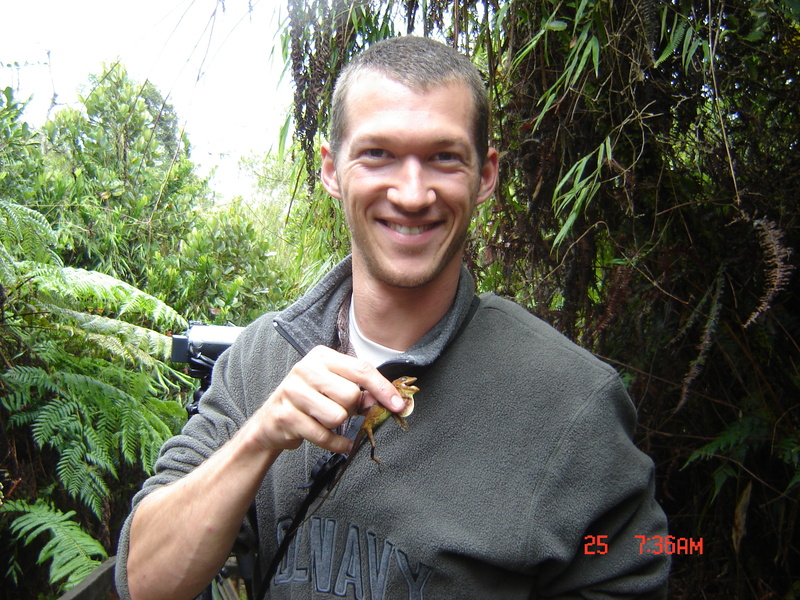 We can also begin to understand long-term evolutionary patterns across padded lizards, including adaptation, convergence and evolutionary constraint. We can also consider how adhesive toes may change how a lizard may use its environment. Ecology and evolution have been topics of interest to me in since I was an undergrad, and mechanics is something I’ve been excited about since I was a kid. My bedroom was covered in Legos and I often took apart electronics and other toys just to figure out how they worked. I think about problems, including evolutionary problems, from a mechanical point of view. This is the main reason why I find the mechanics behind gecko toe pads to be so interesting. There are many different types of gecko toe pads. Some species have fan-shaped pads (upper left), some have divided pads (upper center), undivided pads (upper right), no adhesive pads at all (lower left) or only pads on the very tips of the toes (lower right). There are three different groups of lizards with adhesive toe pads: geckos, anoles and a few species of Pacific island skinks. These groups are distantly related, which tells us that toe pads most likely evolved independently in all three groups – and probably multiple times within geckos. The adhesive pads of these lizards have important characteristics at multiple size scales. At a broad scale, different lizards have differently shaped pads. Some species have undivided lamellae (the horizontal scales on the bottom of lizard toes), others have divided lamellae, some have fan shaped lamellae or only one or two pads on the very tip of their toe. Some species that spend their lives on the ground don’t have any pads at all. 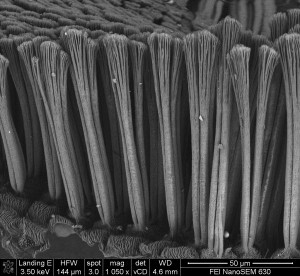 When we look closer at the adhesive pads using electron microscopy, we see millions of very small structures called setae. They may look like hairs, but only mammals have hair. Instead, setae are actually modifications of the outer layer of skin. Reptile skin (and setae) are made mostly of beta keratin, a protein similar to the material from which our fingernails and hair are made. Lizard setae are much, much smaller then a human hair. The length of most setae is equal to the width of our hair (about 100 micrometers). Setae are so small that the atoms in the tip make very weak chemical bonds with the surface they’re walking on (Van der Waals force). This weak force is what makes them stick to a surface. This type of adhesion is very different from Velcro or suction cups or glue or most other sticky things we commonly encounter. We can use an electron microscope to look at gecko setae. These setae are about 100 micrometers tall and cover the adhesive pads of geckos. Setae are branched at the tips, kind of like a bushy tree, with each tip making a weak chemical bond with whatever the gecko is walking on. When all the setae tips are added together, the entire gecko toe pad can actually make really strong adhesive forces. 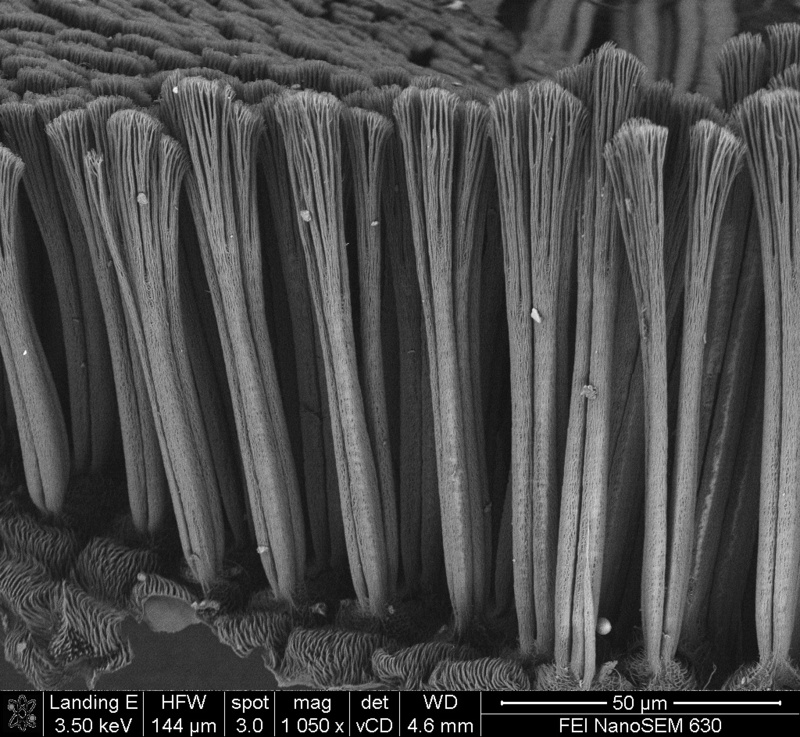 The shapes of gecko toe pads and setae are valuable in understanding how they function. That observation is interesting not only to biologists, but also engineers. There are a lot of researcher teams working to recreate structures similar to lizard setae using synthetic materials. If successful, these inventions would be valuable in many different industrial fields. Researchers have already developed robots that can climb vertical walls and small racecars with synthetic setae-like structures on their wheels that can drive up vertical racetracks. 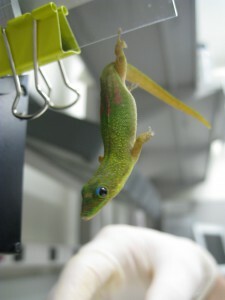 Gecko setae have also been used to pick up and place very small computer chips to build tiny computer components. In my work, I am trying to understand how setae shapes affect their function. I measure how setae are shaped (using microscopy), measure how they work (by measuring the friction and adhesion with really sensitive force sensors), and look for patterns. For example, we have found that geckos with longer setae can create more adhesion with less effort. One shortcoming of only comparing shape and performance is that it doesn’t explain why longer setae work the way they do. In order to understand the mechanical relationship, we need to use biomechanical models. Using our understanding of physics, we simplify setae into shapes that are easier to work with mathematically, like solid, straight rods. We can then write mathematical equations describing exactly how setal adhesion works. We make predictions based on these models and compare them to our actual measurements in the lab or the field to see how well our models describe real life. Through this process of building models and testing them, we can make increasingly accurate models to help us understand the mechanics underlying how gecko toe pads work. Testing current biomechanical models using lab and field observations is a significant part of my thesis. One way we can measure the stickiness of a gecko’s toe pad is to measure the angle that their toe falls off of a piece of glass. Stickier geckos can hang on through steeper and steeper angles. Another focus of my thesis is to study how the ecology of geckos may be related to their toe pads. Our biomechanical models give us some guesses about how toe pads should be adapted to different environments. I’m currently developing a project in Australia that will investigate whether our predictions of form and function apply to geckos on the Cape York Peninsula. For example, previous work suggests species that live on rough surfaces (like sharp rock or rough bark) need stickier toes because it’s harder to make good contact with a lot of the surface. On the other hand, species that live on smooth rock or bark might not have to be as sticky. Also species that live higher off the ground may be stickier in order to have a larger safety margin so they’re less likely to fall out of a tree and hurt themselves. By testing the relationships between a gecko’s habitat and toe pads, we can find evidence of adaptation. geny, to find interesting evolutionary patterns. Geckos first evolved around 200 million years ago, and have since colonized every continent expect Antarctica. By studying how toe pad characterizes are spread out across the phylogeny, we can learn about the evolutionary processes guiding toe pad change. Do we see lots of change early in the tree? This might suggest that toe pads played an early role as geckos spread across the Earth and formed new species. How different are the toe pads of different groups of geckos? We have already found multiple examples of very distantly related geckos having very similar toe pads. Why is this? By combining biomechanical models, habitat, and large-scale evolutionary patterns, I hope that my work will help us build a stronger understanding of how gecko toe pads work and how they may have adapted to each species’ environment. We can also highlight interesting evolutionary patterns that describe how gecko toe pads have changed through time. For more information about Travis’ work, you can contact him at thagey at uidaho dot edu.